You sit down, open up your writing document and … nothing. No, you don’t have writer’s block, you’re just having trouble getting going. If you’ve ever been in a situation like this, you know how frustrating it can be. Thankfully, there are lots of templates available nowadays that not only help you get started on your writing journey faster, but offers good insight into what a successful writing format looks like. Such is the case with the resource created by the guys at SocialTriggers.com. 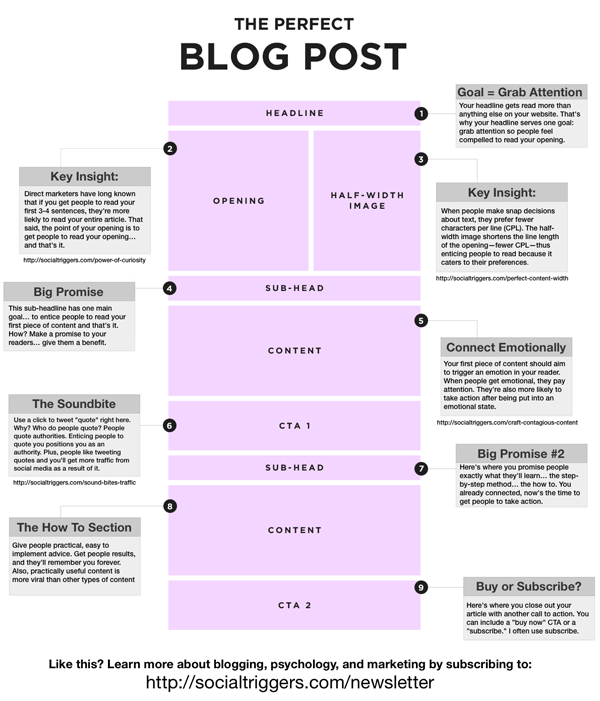 The resource outlines the nine components of the perfect blog post. It also shares key insights and helpful tips for crafting your next blog article. Readers, do you agree this is an accurate template for a “perfect” blog post? Share your thoughts with us in the comments section.